I have Keratosis Pilaris all over my legs and arms, and am currently using a mixture of coconut oil and apple cider vinegar to treat it (applying topically as a moisturizer). I also dry-brush my my skin vigorously about 3 times a week, and drink apple cider vinegar every day. So far this has improved the KP about 50 percent, I have kept up with this routine for about 3 weeks now. 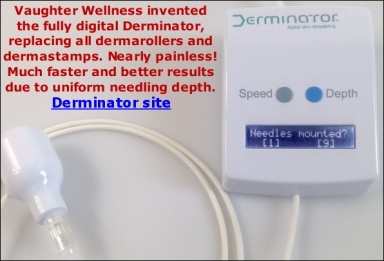 I am wondering if using the derma roller will help with the KP? Or are there any other treatments o KP you can recommend? * Topical exfoliants. Medicated creams containing alpha-hydroxy, lactic or salicylic acid or urea moisturize and soften dry skin while helping to loosen and remove dead skin cells. Depending on their strength, certain creams are available over-the-counter and others require a prescription. Your doctor can advise you on the best option for your skin. The acids in these creams may cause redness, stinging or skin irritation, and therefore they aren't recommended for young children. * Topical corticosteroids. These anti-inflammatory drugs help decrease cell turnover by suppressing the immune system. Low-potency corticosteroid ointments, such as hydrocortisone or derivatives, are usually recommended for sensitive areas such as your face and for treating widespread patches. Doctors usually prescribe corticosteroids for short-term treatment or for temporary relief of symptoms. They aren't used as long-term treatment due to potential side effects from absorbing stronger corticosteroid creams or thinning of the skin. Topical corticosteroids may also cause local burning, itching or irritation. * Topical retinoids. Derived from vitamin A, retinoids work by promoting cell turnover and preventing the plugging of the hair follicle. Retinoids may be an effective treatment, but they can cause bothersome skin irritations, such as severe dryness, redness and peeling. Tretinoin (Retin-A Micro, Avita) and tazarotene (Tazorac) are examples of topical retinoids." Kerasal has products for foot calluses that has concentrated exfoliants like 10% urea and 5% salicylic acid that may work well, but can be more irritating so use with caution. For retinoids, Sarah does sell Tretinoin 0.05% in her shop! It is in gel form. For tazorac and adapalene, I think you have to go to the doctor for that one. I think Sarah says somewhere on another post that derma rolling increases cell turnover, which theoretically can heal KP. Thank you both for replying so quickly:) K, I actually have been drinking apple cider vinegar every day for its health benefits. When I was reading on the internet about its health benefits, I read somewhere that it helps with KP. I did some more research and saw in some KP forums that people have been using it with some success to treat their KP. Also read that some use coconut oil by itself, and some combine the two. So i tried it, and it does seem to work (except that it stings when I apply after dry-brushing). I'm not sure whether coconut oil clogs pores or not... but i had also wondered about the same thing. Sarah I have tried using a pumice stone before but only used it in the shower- perhaps I'll try using it when my skin is dry, as you've suggested. The Kerasal sounds interesting have not tried it before. Can I find it in a drug store, or it it something i will have to order? Thankyou Sarah, I appreciate your effort. I'll use your link to order it from Amazon ; It seems that they sell it in some branches of Walmart but i think that might be in the states, and I am in Canada. Sarah, wouldn't you want to avoid pumice stone or loofahs because they can be too abrasive? Wouldn't the gentler route be topical exfoliants and let the shedding of skin takes its place instead of scrubbing it away? Well of course you can always monderate your pressure. But I guess I would prefer the less pressure-needing method. In Keratosis Pilaris, hair follicles are clogged by keratin. Keratin is an extremely tough protein (nails, horns and hooves are for the most part made of keratin). It really would require significant abrasion to remove it. The best is to use keratolytics (they soften keratin) such as salicylic acid, urea or retinoids and mechanically remove keratin plugs with pumice (dry pumice on dry skin). The skin will get a little red and slightly irritated but it will subside very quickly. Do not apply any acidic product after pumice – it would sting. Soothe it with some coconut/almond oil. Shaving the skin might also help (it serves as good exfoliation). Don't use a pumice stone on the face and neck.